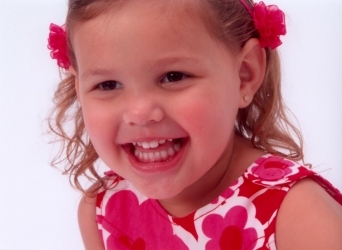 Your child’s first regular dental check-up should be at age 3. 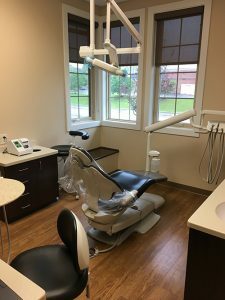 The first visit is usually short and consists of riding the chair, showing the dental “camera” (x-ray unit) and dental instruments, counting and polishing the teeth, and flossing. Fluoride may be applied at the dentist’s discretion. We sometimes take x-rays on the first visit if the child has a tooth ache or trauma has been experienced. Regular bitewing x-rays are usually taken at age 4. We may ask the parent to hold their child as they lay back in the chair to make the child feel secure and safe. Home care for the child’s teeth is reviewed with both the child and the parent to promote great oral hygiene and a healthy mouth. It is important to note that all children need parental help brushing until they have the manual dexterity to write in cursive. As the child gets older and more familiar with the office, the parents are encouraged to remain in the reception area to facilitate patient cooperation and trust in the dentist and to protect the privacy of other patients in the office. As the child’s teeth are developing, we rely on the parents to notify us of any developmental or environmental problems that may be seen in the teeth between check-ups. Please inform us of any other concern you or your child may have. The best way to prepare your child to see the dentist is to read them books about their favorite character going to the dentist. Dora has a great, true-to-life book that depicts accurate drawings of the dental tools and office equipment. Let them know what to expect from the visit and practice opening the mouth and showing the teeth. Lastly, speak positively about your dental experiences and assure them that it will be easy and fun. Cavities are no longer inevitable for children. We have fluoride and sealants to protect their teeth from decay. Sealants are unfilled resin applied to the chewing surfaces of teeth were pits and fissures (grooves) can collect bacteria which can cause cavities. Sealants and fluoride treatments are just a few of the ways we will lay the foundation for a lifetime of good oral health and positive dental experiences. Cavities are caused by bacteria that metabolize the food we eat. This causes an acid reaction within the first 20 minutes after eating. It is important to note that the frequency of sugars on the teeth is the single most important determinate of cavity formation. For example, sipping 1 can of soda all day long is actually more detrimental than drinking one can of soda with each meal. Diets rich in sugary food along with a lack of brushing and flossing can accelerate the formation of cavities.